Subodh Gupta: What does the vessel contain that the river does not? found boat, found objects, found utensils, fabric, steel, found fishing net, bamboo, rope, plastic pipe. 573 x 152.4 x 122 cm. 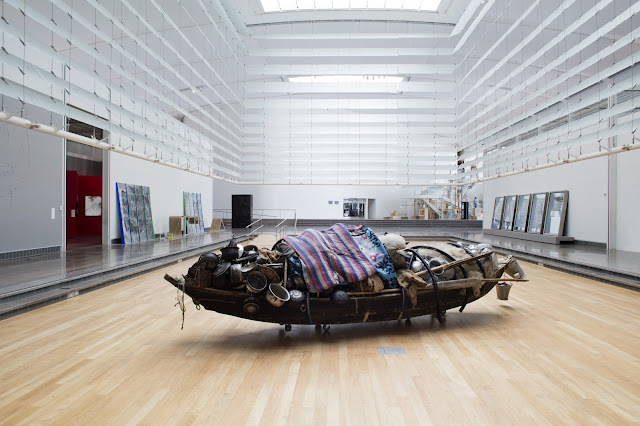 What does the vessel contain that the river does not?, 2014 by Subodh Gupta is a monumental sculpture commissioned by the Queens Museum. As a part of After Midnight: Indian Modernism to Contemporary India, 1947 / 1997, Gupta’s work takes the center stage of this exhibition. The installation of the work occupies the museum’s floor-level atrium space. This position elevates the significance of Gupta’s work in relation to the theme of the exhibition. This particular work narrates a story of a long and arduous journey that toils from day into the darkness of night. 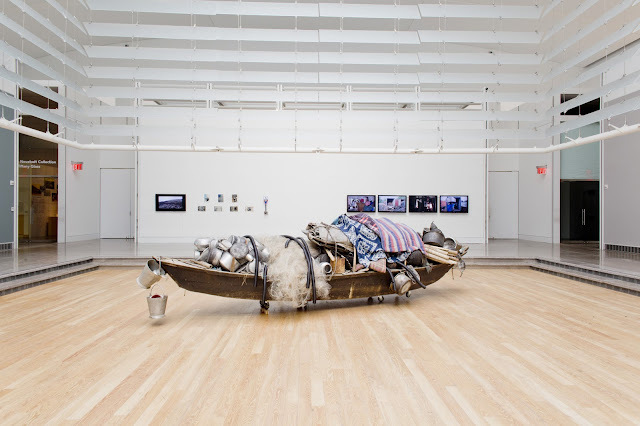 Looking from a distance, this work consists a life-size wooden boat filled with miscellaneous everyday-items with markings and indentations due to frequent usage. These objects piled on the boat heavies down the vessel to its maximum physical capacity and to the extent of overloading. This visual effect heightens the desperateness of a migrant who is taking everything he has and needs in order to survive a journey. What does the vessel contain that the river does not?, 2014 is about transience and insecurity. The four wheels placed underneath the boat point to the precariousness and unstable mobility of the vessel. If the wheels were to be released, the boat could move in any direction without a definitive destination. The motif in most of Gupta’s large-scale works is the use of metal domestic containers such as the dabbas. These steel food containers are widely used in South Asia for carrying meals. On this boat, there are more than one dabbas indicate that the vessel is transporting a family. Tied to one end of the boat, there are other pots and pans for preparing meals. The dull and worn appearances of these domestic objects suggest the owner as someone who has endured poverty and hardship. To balance off the harsh arrangement of the metal objects, the artist places a fishing-net weaved with thin white nylon strings as fine as human hair. By doing this, the artist adds to the narrative of an ingenious migrant who must rely on catching small creatures of the sea as nourishment. For this piece, the artist also includes other items of necessities such as blankets for sleeping and shielding disagreeable weather. These additions convey the idea of making the vessel into a temporary home while on the search for a better one. The mismatched patterns of the blankets hint that they are found through various sources. With bits of white cotton showing through the torn fabric, these blankets must have seen better days. Gupta’s choice of patterned cotton blankets changes the texture of this work. They softly drape over the bric-a-brac and covers up the harshness underneath yet they also reveal a trying past. Extending the narrative, the artist incorporates building materials for a potential rest stop and a new home. Such as, wooden sticks of various lengths, tin roof pieces and plastic tubes are placed in the vessel. For example, the wooden sticks could serve as the main support for a home, the pieces of tin could be the roof and the tubes could be used to supply water into the home. These items placed next to the fishing-net and the blankets convey a sense of a migrant’s self-sufficiency and inventiveness. The choice of putting Gupta’s What does the vessel contain that the river does not?, 2014 in the center of the museum’s atrium is a metaphorical bridge connecting the two sections of the exhibition. 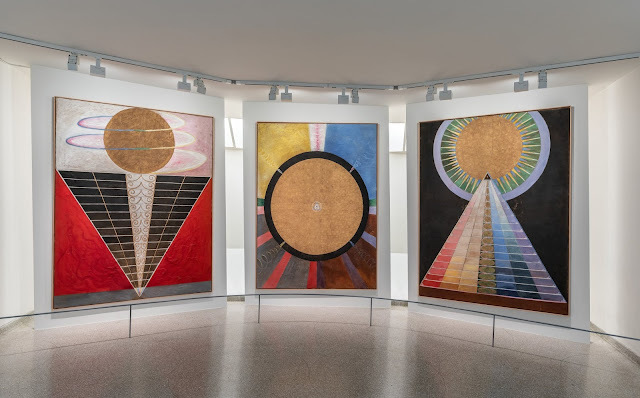 In the one side of the exhibition are works of early modernist panning from the 1940s to the 1970s, while in the opposite gallery space are works done mostly in the 2000s. The work’s placement recedes far into the space, which requires the viewer’s effort to walk a few paces closer in order to see all its details. Metaphorically, it is informing when one wish to examine a nation’s artistic progression one must take the time to get closer and look carefully for nuances.